A sun-protecting spray with full broad spectrum protection. This is packaged with a handy continuous spray nozzle which provides an easy application in hard to reach places. It goes on white and dries clear after being rubbed in. Fragrance-free, oil-free, paraben-free, sensitivity-free and noncomedogenic. 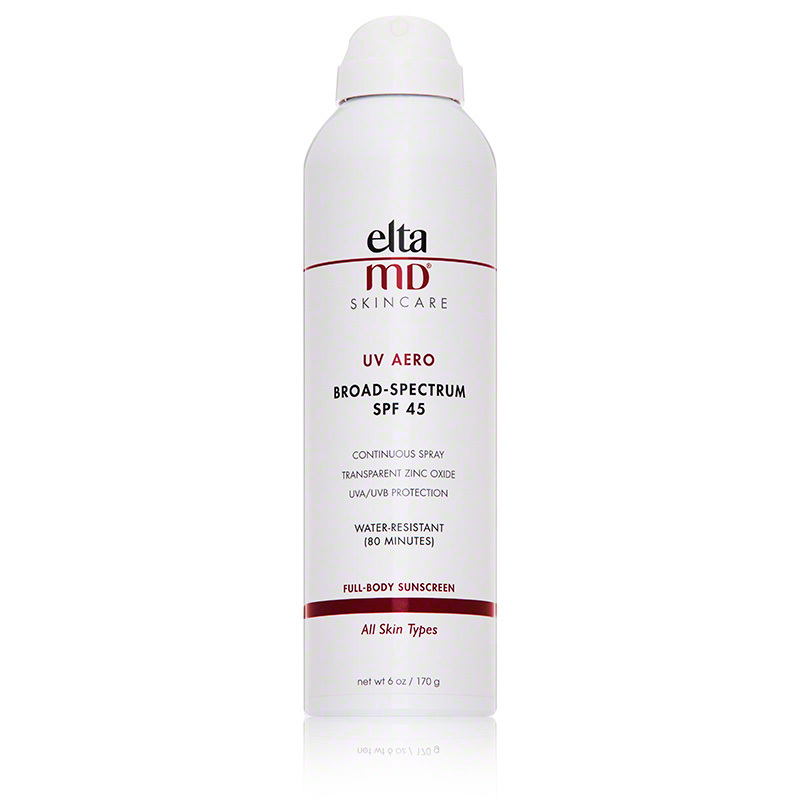 EltaMD UV Aero Broad-Spectrum SPF 45 shields the skin from the harmful effects of the sun. Zinc oxide provides protection from UVA and UVB rays to prevent sun and aging damage. The lightweight formula goes on white and dries to a clear finish without leaving skin greasy. Shake well before use. Apply liberally 15 minutes before sun exposure. Do not apply in windy conditions. Hold can (upright or inverted) 4 to 6 inches away from body and apply liberally, spraying slowly and evenly until product is visible on skin. Gently rub in. Do not spray into face. Spray into hand and apply to the face. Use in well ventilated areas. Reapply after 80 minutes of swimming or sweating and immediately after towel drying at least every 2 hours. Active: Zinc Oxide 9.3%, Octinoxate 7.5%. Inactive: Butylene Glycol, Capryloyl Glycine, Cyclopentasiloxane, Dimethicone, Dimethicone/PEG-10/15 Crosspolymer, Dimethicone/Vinyl Dimethicone Crosspolymer, Isobutane, Lauryl PEG-9 Polymethylsiloxyethyl Dimethicone, Phenoxyethanol, Propane, Purified Water, Sodium Chloride, Triethoxycaprylylsilane, Undecylenoyl Glycine.